Billing checks are necessary in order to ensure that everything is correct before you go through a bill run. The steps in this guide apply when you bill ad-hoc and fixed, separately from recurring charges. An example use case for this type of billing check would be when you need to invoice clients for one-off charges for products and services; such as for a meeting room booking. The Unbilled Charges Report - You can find it under Reports > Charge Sheet Reports > Unbilled Charges. Use the report options to filter the data you might need. You can choose to run the report by Organization, Client Type, Location or Account. Choose the billing period and accounts according to your current needs and check what you need from the Product Groups section. Run the report and you should see whether there are any unbilled charges. If the report does not show all of the charges you expect to see, then check your charge sheets and add new ones as needed. 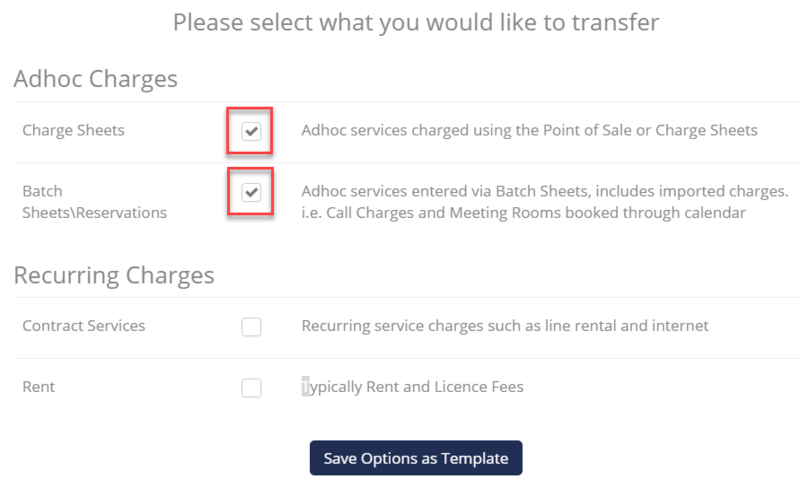 Batch Sheets - To check your batch sheets, go to Charges > Batch Sheets. Click on the Batch Date column header once to sort the column by date. Scroll down the column and check the date range that the Batch Sheets cover, make a note of the earliest and latest dates. If you do not see the Batch Date column, edit your list view and add the field. Next, select each batch that you need to check and click the pencil icon next to it. This will allow you to edit the batch as needed. Scroll down and check that there are no lines with a zero value under the Unit Price column. This would prevent the whole batch from being transferred. Edit other details as necessary. Make sure that the batch sheet is completed and approved - the checkboxes corresponding to these respective options will need to be ticked. WARNING: If batch dates are not within the period that you are billing for, your batch sheet will not be transferred for billing. The same occurs if the batch sheet is unapproved. Meeting Rooms and Workspaces - Check your meeting bookings from within the Calendars tab. Filter for your location and group as needed or leave all locations and groups unfiltered to see all bookings at a glance. Select the Monthly view of your calendar and make sure that all of the bookings have a Confirmed status. Unconfirmed bookings (Unassigned, Provisional and Cancelled) will not be billed. Draft invoices - Go to Invoicing > Draft invoices and make sure that the invoices that correspond to your billing period are final and have been approved. First, click the Due date column header once, to sort your invoices by due date. Look over the ones that fit within your billing period and check the ones that are still in draft. Make any needed changes and approve the drafts so that they can be billed. (If you do not see the Due Date or Invoice Status columns, filter your list view and add the fields.) If any draft invoices should not be billed, you can leave them as-is or delete them. Once you have performed your billing check and you are sure that everything is correct, you are ready to go through the bill run. Start by going to Invoicing > Bill Run. This will take you to Operate's bill run wizard. Under Ad-Hoc Charges, make sure that both the charge sheets and Batch Sheets\Reservations checkboxes are checked. Under Recurring Charges, uncheck both contract services and rent. Optionally, save these options as a template that you can use during future bill runs. Click Next when you are ready to proceed. Select Charge Sheets by first choosing a date range for charge sheets - we suggest selecting the 'Up Till Now' option if this is your first bill run For future bill runs, we suggest selecting the period that has passed since your last bill run. There are preset intervals already available and you can also set a custom date range. Next, select the customers you want to bill. You can choose to bill your entire customer base at once; or choose specific accounts. Select Batch Sheets/Bookings by selecting a date range as well. Typically, this date range should coincide with the one you have selected for charge sheets. Select customers - Once again, this should be the same as for charge sheets; then select a batch . You can choose to bill one specific batch of charges, or more, depending on what you need.